Ooooo! I’m very excited to hear this. I’m looking to do about the same as you on a cubieboard2. I was thinking of using fluidsynth instead of amsynth, but I’m open to suggestions. Where is the post on the forum about this info, and did you provide patch(es) for the audio driver, too? Also, does the kernel source you used as a base have the GPIO drivers, or is that a patch, too? Thanks, I’m fairly new to embedded stuff. I’ve ordered my cubie, but have not received it yet. Hello John, I’ve added links to the patches. No idea about the GPIO drivers, I think they’re included. I am working on full duplex good quality (Opus) Audio over IP using Allwinner A10 on Cubieboard and Olimex (awaiting a Cubieboard2) and quality is perfect but audio latency is the biggest problem; just going in and out of a single board using alsa or jack before I even get to the internet. I would like to try your RT and Driver patches but the links will not connect. Do these patches still exist anywhere? P.S. 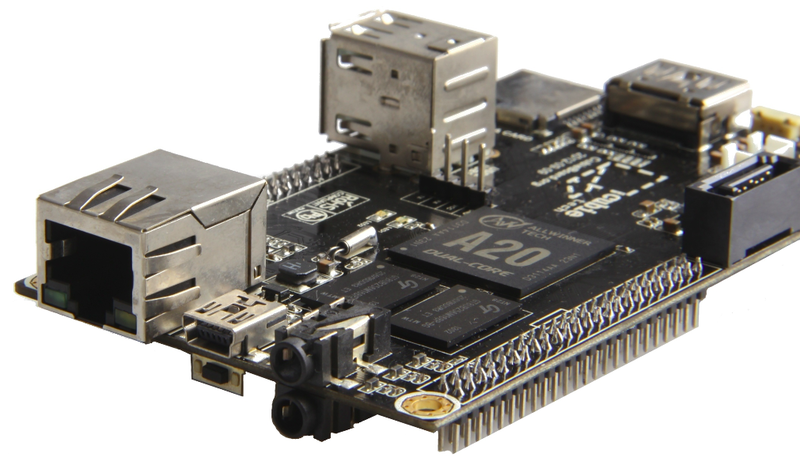 I also have a BeagleBone Black for disposal. No need for apologies -things happen. I will keep a good lookout. Hello Robert, I’ve restored the contents of the cb2.autostatic.com site so the patches are available again. If you have any questions don’t hesitate to contact me. Many thanks. I have got them and will have a play. Hi Robert, apologies for the late reply. I fear I can’t help you as I have no experience with OpenOB or sending low-latency audio over networks in general 🙁 And since this issue also occurs on some laptops I don’t think this issue is Cubieboard or BBB related. Your best bet is probably to ask on the “OpenOB mailinglist”:http://lists.talkunafraid.co.uk/listinfo/openob-users. Did you manage to get the Cubie’s audio codec to run at 24bit ? The driver states only SNDRV_PCM_FMTBIT_S16_LE but the A20 data sheet states it works with 24bit resolution. Hello Gianfranco, no I haven’t. Try changing the bitrate in sound/soc/sunxi/sunxi-codec.c (the .format entries on lines 103 and 127). I’m new in cubieboard world, and this very topic reassured me when I were hesitating on wether buying or not this little wonder. My project is to get puredata soft working together with jack in rt mode, and your work represents a big step forward for someone who wants to get such a sharp setup ! Thank you so much. I thought I had to set up everything manually when I stumbled upon your cb2 repo and the “drumtuners” image . It boots flawlessly, but can’t login. Could you please tell us more about pwd and login, please ? I’m somewhat frustrated because I spent a lot of time to try to start jackd2 on my cubie2 using your “drumtuners” image. I know that this image is maybe not meant to be “plug and play”, but the rt and audio driver patches seem to be incorporated. Soo nice ! I followed the (again, patched) jackd2 installation procedure seen at http://www.cubieforums.com/index.php/topic,958.msg5885.html?PHPSESSID=q2sopsosa3rbd7h0j04br8cn47#msg5885 , and tried many variants of jackd command lines. 2) After that I change the “-r” to become “-R” in the command line (had killed jackd before), and same scenario as before, just one more line to read in jackd messages informing that jackdmp runs in realtime with a priority of 10 (default). Cannot connect any client anyway. 4) and now, the weird : when I try to run jackd with the command line used in 1) (not realtime,thus) jackd doesn’t start anymore, and now gives the error mentionned at 3). A kind of “memory effect”. The more frustrating among all is that ONE TIME it worked, I could see system inputs and outputs in patchage, fire up yoshimi and hear sound ! But never got it to work again, never. I guess I should configure my system further (there’s no .asoundrc nor .jackdrc file, for instance), any hint ? should everything be launched by the user or some with a sudo (I can’t login as root, I noticed). Topic http://comments.gmane.org/gmane.comp.audio.jackit/28474 makes me dubious on permissions. I also tried using “~/bin/jackstart” but it gave me hundreds of stderr lines I can’t reproduce now (due to this weird memory effect). And the arguments passed to jackstart seem to be ignored, though I couldn’t find where the defaults settings were stored (a rtprio of 84, for instance, as when I launch jackd with a “-R” argument it gives a default rtprio of 10). How do you use it? What do you think ? Sorry, I’m sorry for the flood. My patched version of JACK works around ARM and packed structs, not any memory issues. -R is a default parameter of jackd, so no need to add it. If you don’t use QjackCtl there’s also no .jackdrc. You don’t need a .asoundrc file. I’d strongly suggest to read the jackd man page with regard to the usage of JACK parameters. jackstart is a startup script that doesn’t take any parameters. The image is already tuned and tweaked and Jack2 should work without issues when using the jackstart script. I guess that should get you going, otherwise send me a mail (jeremy[at]autostatic.com) if there are any further questions. I first tried CLI only for three days or some, and nothing worked. I couldn’t convice myself that jack was running but didn’t accept any connection so I wanted to install X server to “see it with my own eyes” and get graph clients to test (I know, this is a bit stupid). I didn’t notice that jackstart actually was a script, quite confused by this page : http://ccrma.stanford.edu/planetccrma/man/man1/jackstart.1.html . Tonite I will overwrite my sd with drumtuners and strictly follow your indications…fingers crossed ! indeed the ‘jackstart’ script odes the job in playback only. But I couldn’t manage getting the input to work. When I launch jackd in duplex mode it doesn’t complain, but the audio playback gets dirty from time to time, especially if I move the usb mouse. First I thought it was just a problem of too small -p and -n values, but afterwads I noticed I couldn’t get anything useful from my audio input. A ‘meterbridge’ applet doesn’t show any vumeter reaction when signal is coming in I can only see a kinda fake background noise volume that increases o decreases when I tweak levels within ‘alsamixer’. I tried an usb soundcard with ease in duplex and 2×128 buffer and a big “puredata’ patch, works fine. I tried to optimize using the rtirq-init script, worked fine. I launch my applications with a manually set rt priority. I’m gonna try ‘realtimeconfigquickscan’ to see if the system can be tweaked further. And among other things my ram is about 650mb (‘free’ command), and that seems a bit low. I guess that some memory is allocated for the graphics, so I get back to the point that console is lighter than a graphical environment (LXDE). I’m gonna see if changing screen resolution will free some memory up. And as a stupid common desktop user I wonder whether it’s possible to run in console mode and then only open grapical windows when needed (I see that as a classical rudimentary x11 use). This could be a nice way to save memory. In the case of a graphical desktop use, dou you think that mali acceleration could be installed with a gain in efficiency (mem, cpu) of audio applications ? Thank you again, this image is very nice and brought me a lot. As you suggested it has Audio I/O . can i use it for speech recognition application? Will it be fast enough to carry out the speech recognition tax using CMUSPHINX toolbox? Any idea ..
My raspi is pretty slow to handel it and also the accuracy also drops down due to slow processing..